RAD301 [syllabus] typically builds on FOOP20x taking you away from the basic building blocks of OOP and focusing on more mainstream developer concerns of UI design and building, data access, frameworks, debugging & deployment. This module is taught currently to BSc. (Ord.) Computing [Software Development] and B.Sc. (Ord.) Computing [Games Development], both in year 3, Level 7. The programming language is C# in the .NET environment. The focus is on developing rich interfaces using a popular declarative markup language and exploring ways to manipulate in-memory and database hosted collections of objects. While in past years I have used WPF/Silverlight as the development platforms, 2013 saw a move away from these towards ASP.NET MVC (currently in version 5). This reflects the increasing re-orientation of MS and indeed the industry around more sophisticated web development. Note that MVC differs substantially from ASP.NET Web Forms that you may be familiar with. So we bid farewell to XAML & WPF and look to ASP.NET MVC and CSS. While CSS will be familiar to Web students from Yr 2, we will employ a simple CSS Framework to automate the styling and layout of our user interfaces. This ensures that the design aspect can be addressed with minimal effort and preserve time for data querying and bedding down our understanding of data models, MVC architecture and web application development. 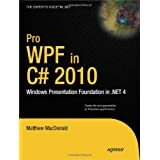 Pro WPF provides very comprehensive coverage of all aspects of WPF. It does not deal with C#. 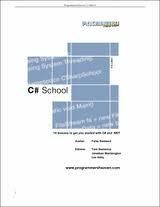 An excellent book on C# at this level is Joel Murach's book Murach's C# 2010. It is current with developments in .NET 4.0 and works well for those not too confident with C#. Murach's approach is unique presenting topics example by example in a very clear layout. Programmers' Heaven free ebook is a first class resource for C#. There are other resources at this site (C# School) that are suited to beginners. Do note that this book however covers only some aspects of .NET 2.0. Beware of this issue since many resources on the web on C# target .NET 1.1 or earlier whereas many new changes in 2.0 render earlier material obsolete.